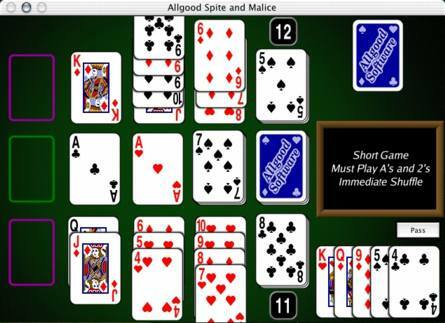 Allgood Spite and Malice is an implementation of the popular card game “Spite and Malice”, a form of competitive patience game (also sold commercially as “Skip Bo”). Try to get rid of all your cards while preventing your opponent from getting rid of theirs. Unlike other competitive patience games, Spite and Malice offers lots of options for strategy and you can get ahead by playing smart. Plus, you can try to stop the other player by blocking their plays. It’s very easy to learn how to play and extremely addicting. Allgood Spite and Malice is Shareware with a cost of $15. Download it and give it a try. If you like it please support further development by registering your copy. Please note that this is a free upgrade for registered Cat and Mouse users. Allgood Spite and Malice is a free download – try it out and pay/register later if you are enjoying it.